Understand the structure, behaviour, and limitations of logic machines with this thoroughly updated third edition. Many new topics are included, such as CMOS gates, logic synthesis, logic design for emerging nanotechnologies, digital system testing, and asynchronous circuit design, to bring students up-to-speed with modern developments. The intuitive examples and minimal formalism of the previous edition are retained, giving students a text that is logical and easy to follow, yet rigorous. 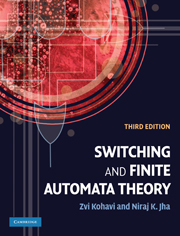 Kohavi and Jha begin with the basics, and then cover combinational logic design and testing, before moving on to more advanced topics in finite-state machine design and testing. Theory is made easier to understand with 200 illustrative examples, and students can test their understanding with over 350 end-of-chapter review questions. Preface; Part I. Preliminaries: 1. Number systems and codes; 2. Sets, relations, and lattices; Part II. Combinational Logic: 3. Switching algebra and its applications; 4. Minimisation of switching functions; 5. Logic design; 6. Multilevel logic synthesis; 7. Threshold logic for nanotechnologies; 8. Testing of combinational circuits; Part III. Finite State Machines: 9. Introduction to synchronous sequential circuits and iterative networks; 10. Capabilities, minimisation, and transformation of sequential machines; 11. Asynchronous sequential circuits; 12. Structure of sequential machines; 13. State-identification experiments and testing of sequential circuits; 14. Memory, definiteness, and information losslessness of finite automata; 15. Linear sequential machines; 16. Finite-state recognisers; Index.